Lively introduction for ages 5-9. In this fully-illustrated introduction to Unitarian Universalism, the simple text and lively full-color art combine to offer youngsters useful and accessible answers to questions like Who Are We?, What Do We Believe? and Do We Pray? 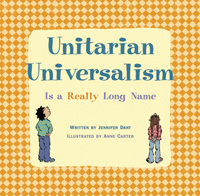 "This appealing children's book introduces Unitarian Universalism with welcoming and child-friendly words and pictures--an excellent resource!" —Janeen Grohsmeyer, author of A Lamp in Every Corner. "This delightful book gives UU children words and concepts to understand our faith and explain it to others." —Ann Barker, DRE, UU Fellowship of Appleton, Wisconsin.